When Governor Wolf unveiled his $34 billion budget burden for Pennsylvania this week, his priorities could not have been clearer: more spending, more taxes, and a greater burden on Pennsylvania’s families and job creators. I can’t ask my community – my neighbors and their families – to send billions more to Harrisburg without exhausting all of the options to fix the spending problems in Harrisburg. Families can’t simply just raise their revenues because the state is spending more. The Governor is proposing devastating tax increases totaling $4.7 billion for the upcoming fiscal year – an increase in overall spending of 16.1 percent from Fiscal Year 2014-15. His proposal would raise taxes by $12 billion over the next two fiscal years – about $1,000 for every man, woman and child in Pennsylvania. Families will pay more in personal income taxes and sales and use taxes, which, under the Wolf plan, increases and makes additional items taxable. Citizens should not be asked to pay significantly more at the grocery story to cover the excesses of government spending. The proposed Wolf increase to the personal income tax will cost families of four earning about $52,000 approximately $331 a year, which is more than one week’s worth of groceries. Combine that increase with changes to the sales tax, and families will feel the one-two punch of this budget directly in their pocketbooks to cover the excesses of government spending. 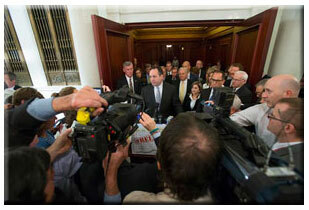 The Governor wants to enact permanent tax increases with the mirage that he is cutting property taxes. Yes, his proposal may temporarily reduce property taxes but it does nothing to keep property taxes from going back up. Gov. Wolf completely ignores the structural issues with the state’s pension system – the same system that drives property taxes up. We have a bucket that is leaking. It would be a misstep to persist at putting water in the bucket without first plugging the leak. We support education funding, however, right now, two-thirds of every new dollar coming into the state coffers goes directly to pay state pensions. The reality is that we have to reform the pension system this year – we have to plug the leak. We have to fix pensions before we consider any new revenue sources for the state budget. Over the past four years, Pennsylvania’s economy has been on the right track. Pennsylvania’s unemployment rate is at the lowest rate in more than six years, and with the right fiscal policies, it can go lower. We will not allow the irresponsible budget proposed by Tom Wolf to destroy the hard work we have done over the past several years to develop a strong business climate and increase access to good family sustaining jobs across Pennsylvania. We can’t spend our way out of this. We need #Relief4PA. As Senate Majority Leader, I will work to move forward with an agenda that gives families and employers relief from government. Unfortunately, the Governor presented a plan that will give government relief from you in the form of higher taxes. The Senate Appropriations Committee has scheduled three weeks of public hearings on the proposed budget, beginning March 16, and the Governor’s budget burden that includes new spending, more borrowing and huge tax increases will come under close scrutiny. I anticipate drastic changes in this budget when it comes out of the Senate. 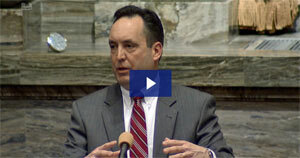 To hear my remarks on the governor’s proposed budget, click here. Congratulation to the students at Penn State University, who raised more than $13 million to fight pediatric cancer in their recent THON event. Penn State student volunteers have helped to raise more than $114 million since the organization began its relationship in 1977 with Four Diamonds Fund at the Penn State Hershey Children’s Hospital. THON has inspired similar events at organizations across the United States, including high schools and institutions of higher education, and continues to encourage students throughout the nation to volunteer and stay involved in great charitable causes in their communities. The mission of the Penn State IFC/Panhellenic Dance Marathon is to conquer pediatric cancer by providing outstanding emotional and financial support to the children, families, researchers and staff of the Four Diamonds Fund. I encourage you to learn more about THON at http://thon.org.